Ohio Women's Bar Association - Lights, Camera, Action - Join us for a screening of RBG! Lights, Camera, Action - Join us for a screening of RBG! Includes one drink ticket and movie ticket. This is for individuals that do not want attend the Networking Happy Hour before the event. This price is for the purchase of a single movie ticket. 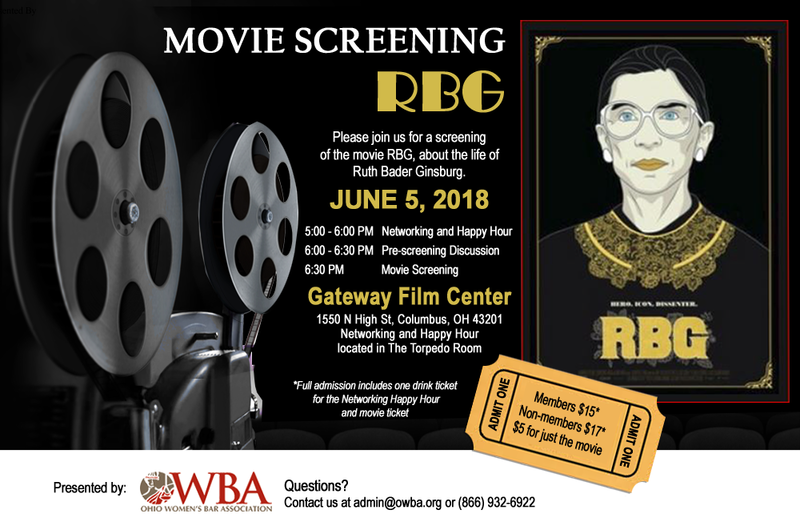 Join us for a special screening of RBG at the Gateway Film Center! Be inspired by the life of U.S. Supreme Court Justice Ruth Bader Ginsburg, her rise to the highest court and her legacy as a pop culture icon. Free popcorn will be provided with the purchase of a movie ticket. There is additional food for purchase at the Torpedo Room and Gateway Film Center's concession stand.